A coupl’a fun ones just released! 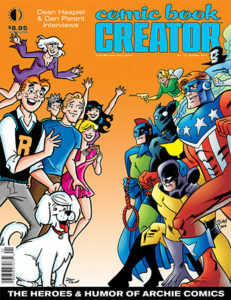 We’ve got two new mags shipping this week: COMIC BOOK CREATOR #16 (75 years of Archie Comics, and interviews with Dean Haspiel and Dan Parent) and JACK KIRBY COLLECTOR #73 (on Kirby’s one-shot ideas and series). Ahh, heck, just go to our home page and click on the covers on the spinner rack at the top of the page, and you’ll go to the previews, with ordering info. Trust us, you’ll love ’em! This entry was posted in TNT on 31 January 2018 by Mr. Morrow. It’s a double-dose of Back Issue with #103 and ‘Longbox’ #61, both in March! 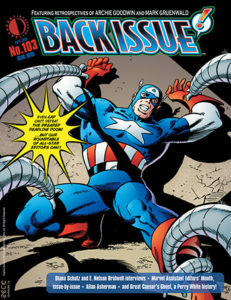 Back Issue #103 is an All-Star Editors Issue! A Pro2Pro roundtable of past and present editors reveal… “How I Beat the Dreaded Deadline Doom”! Plus: retrospectives of Archie Goodwin and Mark Gruenwald, a vintage interview with fan-turned-pro E. Nelson Bridwell, a career-spanning interview with Diana Schutz, Allan Asherman revisits DC’s ’70s editorial department, Marvel Assistant Editors’ Month, and a history of the most famous editor in comic books, Perry White! Featuring an unpublished alternate cover of 1981’s Captain America #259 by Mike Zeck! Edited by Michael Eury. Preview it HERE! 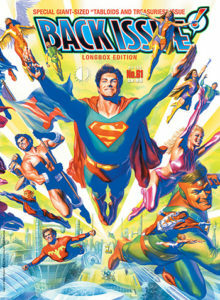 And Back Issue #61: Longbox Edition reprints the original sold-out issue #61 at standard magazine size, so you can fill the hole in your Back Issue collection! It looks at “Tabloids and Treasuries,” spotlighting every all-new tabloid from the 1970s, and a checklist of reprint treasury editions. Superman vs. the Amazing Spider-Man, The Bible, Captain America’s Bicentennial Battles, The Wizard of Oz, even the Paul Dini/Alex Ross World’s Greatest Super-Heroes editions! 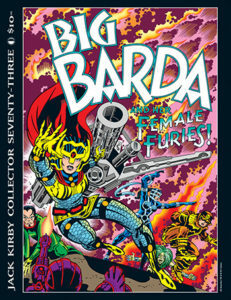 Commentary and art by Adams, Garcia-Lopez, Grell, Kirby, Kubert, Mayer, Romita Sr., Toth, and more. Wraparound cover by Alex Ross! (Note: This issue is not part of your subscription, and must be ordered separately!) Pre-order it HERE! This entry was posted in TNT on 22 January 2018 by Mr. Morrow. Draw! #34 and BrickJournal #49 are both now shipping! This entry was posted in TNT on 16 January 2018 by Mr. Morrow.